When you enrolled in your scuba course, I’m sure there was talk about the benefits of purchasing your own equipment for the course. Dive stores survive off of gear sales, not certification fees. And because of this reality, most stores do and will push for divers to own their own gear, above the standard snorkeling package. This has two sides to it. First of all, safety is number one in dive training. Having your own equipment and learning in that equipment makes you very familiar with all its features and benefits. It most likely will fit you better than borrowing or renting. This in turn increases your confidence in the water and makes for a more enjoyable diving experience. On the other hand, if you don’t buy gear right away, don’t borrow equipment from a friend, your friend will assume any liability if lending it to you, but rather, rent from the store you are taking your training with. The store staff will fit you with whats most appropriate regarding fit and comfort. The gear they rent should be properly serviced and provide for a good experience to complete your training. Just remember, every time you want to go diving, you will be renting unfamiliar equipment. In a way, that’s not a bad thing. It will give you an opportunity to try different equipment before you buy. So, to answer your question, you don’t need to purchase hard goods right away. Just rent the best you can for the time being. 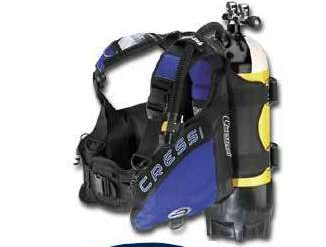 When renting, ask the dive center if they have different rental gear with different features you can try. But DO, and I repeat, DO…, save or finance to get your own gear. Owning your own gear will save you plenty of money in rental costs and reduce anxiety from using unfamiliar equipment. NOTE of CAUTION: Watch out buying life support equipment on auction sites. You never know how its been used or serviced and if parts are still available to service the item prior to diving. I have known many a new diver that have purchased on auction sites, only to discover parts are no longer available for servicing or the item was recalled due to safety issues. When the time comes you can afford your own gear, remember you want service, so I recommend to purchase from a place you can get service, returns and exchanges, Your local Diving Center. Good luck . Winter Projects and Tips to stay immersed in diving. The Gem of California’s Central Coast, Monterey Bay. So you want to learn to scuba dive, where do you begin…?